The website will provide all information abou the Emerging Kerala event to be held in Kochi from September 12-14 2012. 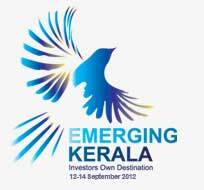 Emerging Kerala is planned as a biennial Global Connect, the first being 'Emerging Kerala 2012' scheduled to be held from 12th – 14th September 2012 at Le Meridien Convention Centre, Kochi, Kerala. The Prime Minister of India will inaugurate the three-day event. Business to Government (B2G) connects. The Event as well as its associated programmes would have the support of the Government of Kerala (GoK), in addition to various Trade and Industrial bodies. The Confederation of Indian Industry (CII) and National Association of Software & Services Companies (NASSCOM) are event partners.